Many organizations must produce documentation from their systems along with software engineering data that meets complex style and format requirements. These requirements might be imposed by clients, business partners, government or industry regulatory bodies. IBM Rational Publishing Engine automates the generation of these types of documents from your data in Collaborative Lifecycle Management (CLM) and other products. In the 2.1.1 release of Rational Publishing Engine, we’ve continued to simplify the user experience with a focus on both template designers and report designers. 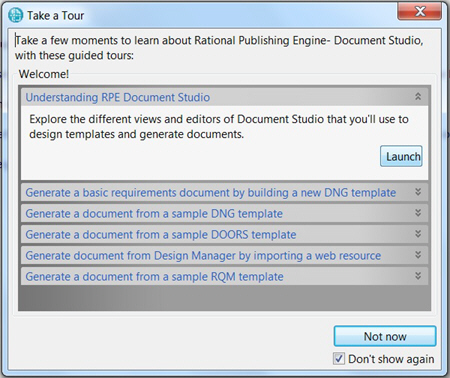 You can watch demos of these and other new features at the Rational Publishing Engine 2.1.1 YouTube playlist. For more details, see New & Noteworthy. Have you ever struggled with getting the data that you want into your document? We’ve added new guided tours in Document Studio to help you quickly build and generate documents for specific data sources such as IBM Rational DOORS and IBM Rational DOORS Next Generation. Simply launch the tours from the Help menu and then follow the steps in the Guide view. We’ve also included new sample assets, including several cross-product templates to help you design traceability reports, for example, printing the details of traceability between test artifacts, work items, and requirements. 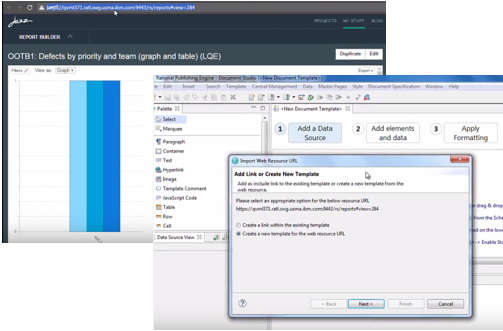 It is now even easier to visually enhance your documents with charts and diagrams. Drag and drop support for creating templates from web resource URLs is now added for graphical report URLs from Jazz Reporting Service Report Builder, as well as communication diagram and object model diagram URLs from Design Management. 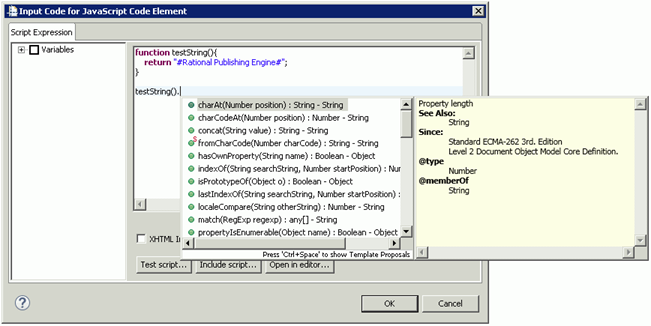 The resulting template and document specification is automatically configured with the REST URL, credentials, and authentication type. You can now include math equations (for example quadratic equations or standard deviations) in your documents. Write your mathematical equation in MathML (there are plenty of samples on mathjax.org), and then copy and paste it into the script editor in Document Studio. Have you ever wanted an image in your document to be a clickable link? Perhaps you want the company logo on your cover page to link to your web site. 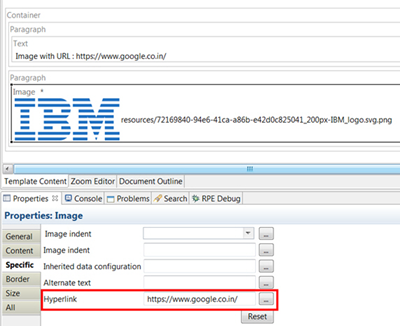 Now you can add links to your images by setting a Hyperlink property on your image. You can also use rich text inside links, for example <sub> tags. Sometimes a particular document generation job can run for a long time, consuming valuable system resources. In Document Builder, administrators can now pause, resume, or cancel long-running jobs. We’ve made a few improvements to simplify working with assets in Document Builder. 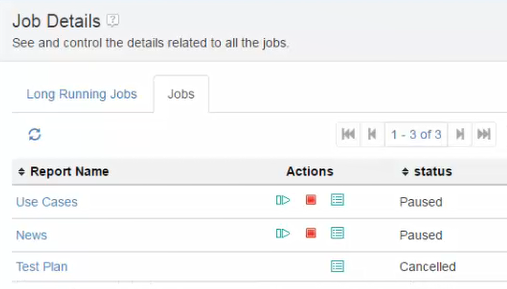 You can pre-load the templates to include in a report by selecting the templates and then clicking Create Report from Templates. You can select multiple assets to tag or delete them. If you’ve tagged several assets, you can expand all or collapse all the tagged groups to find assets more quickly. If you need more screen real estate, the navigation sidebar is now collapsible. In CLM 6.0.3, you can now split a project into finer-grained components if your project is enabled for configurations. This allows you to create versions and variants of a product or system by reusing its parts. You can use Rational Publishing Engine to report on this new component attribute. We’ve added support for Windows 10 for the desktop client. For Document Builder deployments, we now support DB2 Workgroup as well as Oracle. The 1.x Remote Services are no longer included with Rational Publishing Engine. Not to worry – many of the same tasks can be performed in Document Builder, and you can migrate many of your existing assets to Document Builder. The Legacy PDF driver is also deprecated in this release. For a complete list of the enhancements in Rational Publishing Engine 2.1.1, see the product documentation which has handy links to the corresponding help on several new features. Rational Publishing Engine works with the IBM IoT continuous engineering solution. To download and install Rational Publishing Engine, go to https://jazz.net/downloads/rational-publishing-engine/.